I SET off with the best intentions but deep down I knew my chances of climbing all ten Mamores Munros in an autumn day lay somewhere between slim and zero. In the end it proved to be a typically Scottish attempt: Brave, but not quite enough. It’s not an impossible task. Completing the ridge involves total ascent of around 9500ft and it can take anywhere between 12 and 20 hours, but plenty have managed it. My fitness wasn’t in question and I had done my homework but unfortunately, I paid the price for allowing myself to be too easily deflected from my original plan. I had intended going up to catch the sunrise, doing the first half of the ridge and then bivvying out for a few hours around 5pm, then starting out again at sunset and walking through the night to a new sunrise. First, a couple of friends intimated that they were interested in joining me. Then I began to look at the October temperatures for sleeping out and the fact there was no moon, and the doubts really kicked in. There was no way back. We set off in the darkness at 5am, rising from the trees above Kinlochleven just as the sky began to show first light, the roaring of the stags echoing all around. Soon we were surrounded by peaks sticking above the cloud and rock walls glowing orange with the newly invigorated sun. The route to Sgurr Eilde Mor took us into the shadows where pockets of frost gripped the ground and the wind chill was noticeable. We emerged on to the summit to be greeted by a countrywide inversion sitting beneath a brilliant sun. It’s a long drop and diversion out to Binnein Beag, and then a huge pull-up of nearly 1600ft to the highest summit on the ridge, Binnein Mor. Seven hours down already, we parted company here and I dashed on to the next summit, Na Gruagaichean. I knew the big moment had gone, but I still had plans to do another three, leaving the western three for the next day. So instead of taking the bypass to An Gearanach, and then climbing on to Stob Coire a’ Chairn, I just went straight to the top of the latter and then dropped down to the outlier before taking the bypass to the exit. For once, common sense had won. I had saved myself a couple of hours and a tired walk out in darkness. 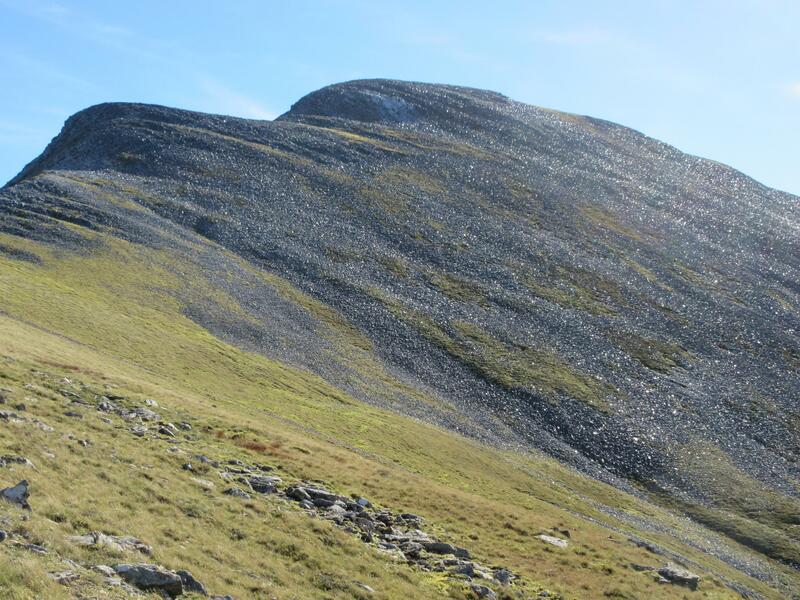 Next day, I had a more leisurely start time for the first two hills, Mullach nan Coirean and Stob Ban, and then I ramped up the pace to nip out and tidy up Am Bodach then headed down the Devil’s Ridge to the tenth Munro, Sgurr a’ Mhaim. The first day had taken 13 and a half hours, the second around nine. That’s a total of nearly 23 hours, but if you take off four hours for an extra ascent and descent, then, in theory, I should have taken 19 hours for the whole ridge. So, a few observations for next time. A midnight start on a fine, long summer day would be ideal for a full-scale assault, with the option of a bivvy two thirds of the way along. It might be best to start from the gentler western end and work my way east. There’s also the added bonus of walking towards the sunrise. 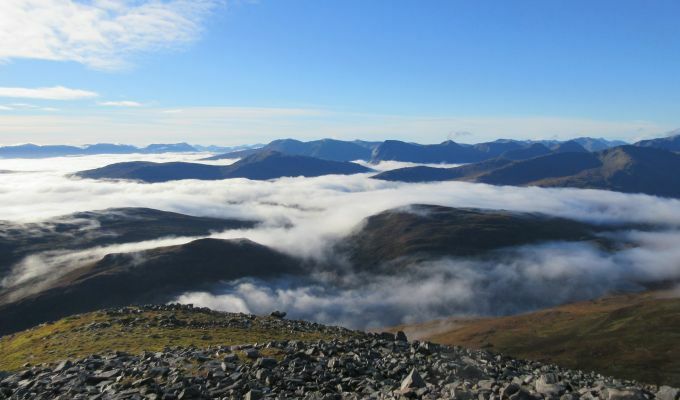 It would also mean that the biggest diversion, certainly in psychological terms, in heading out to Sgurr a’ Mhaim would be tackled early in the day when the legs are fresher. This was the biggest mental barrier to be overcome on the first day, although it turned out not to as bad as I had remembered. 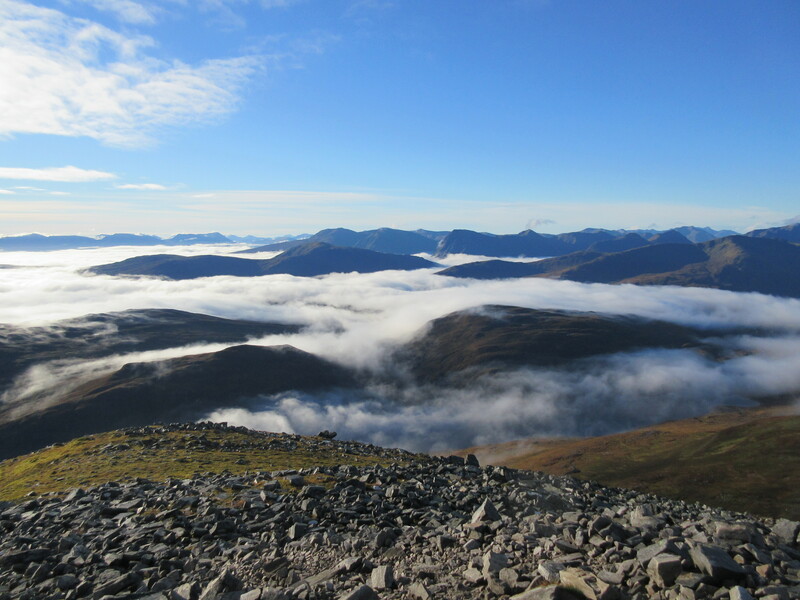 Still, ten Munros in two days was a good result. Now I just have to remember to follow my own advice when I tackle the nine Fannaichs.